NASA's Mars Orbiter has discovered a brand new impact crater on the Martian surface — and it's a beauty. The crater measures about 100 feet (30 meters) in diameter. The image, snapped by the High Resolution Imaging Science Experiment (HiRISE) camera on NASA's Mars Reconnaissance Orbiter, shows a large, rayed blast zone that painted the surface with a pattern of bright and dark tones. 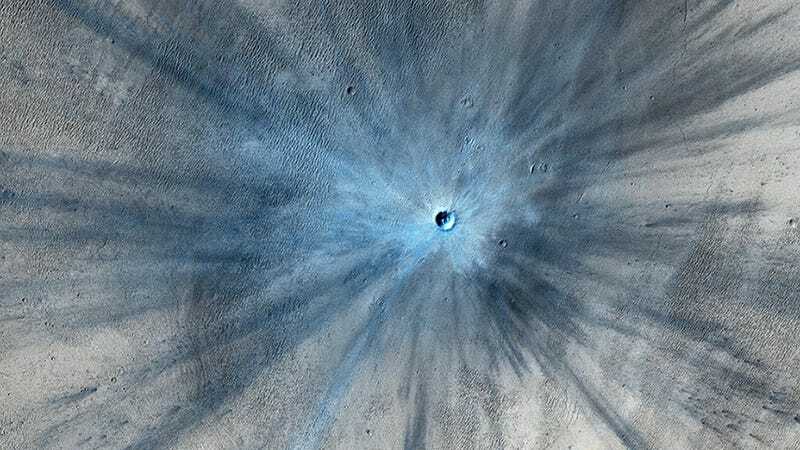 Because of the dusty terrain, the fresh crater appears in blue in the enhanced color of the image; NASA says this is due to the removal of the reddish dust in that area. The impact threw material, or ejecta, as far as 9.3 miles (15 kilometers). The new crater is located at 3.7 degrees north latitude, 53.4 degrees east longitude — so set your Martian GPS. Using before-and-after images, NASA believes the impact must have occurred some time between July 2010 and May 2012. This particular image was captured on November 19, 2013, but was only released to the public today. Mars is struck by at least 200 celestial objects each year.